The Navy says it plans to kick out 28 sailors assigned to the aircraft carrier USS Ronald Reagan for using a synthetic drug that mimics marijuana called Spice. SAN DIEGO (AP) — The Navy announced Monday that it plans to kick out 28 sailors assigned to the aircraft carrier USS Ronald Reagan for using a synthetic drug called Spice that mimics marijuana. The announcement comes only a month after a similar investigation into illegal drug use led to the dismissal of 64 other sailors — also from the San Diego-based U.S. Third Fleet, which includes the Reagan. 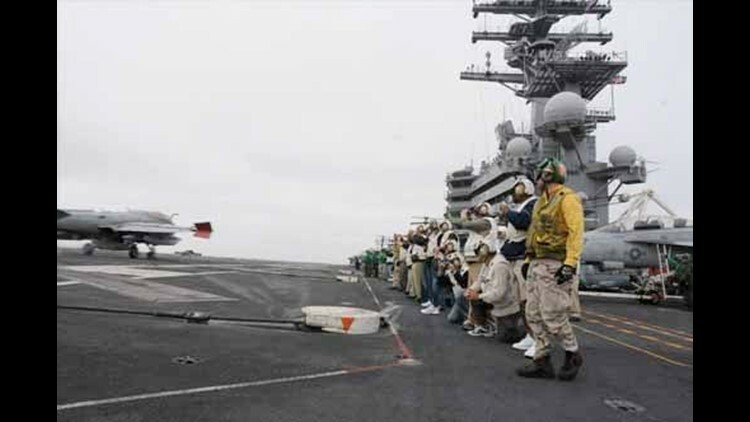 Some of the 64 were assigned to the USS Carl Vinson, the carrier from which Osama bin Laden was buried at sea. The 28 sailors were part of six probes conducted by the Navy in the past month. The Navy has banned the use of fake pot, and officials have been aggressively investigating its use among sailors. The drug is a mixture of herbs and chemicals that mimic the active ingredient in marijuana but with more serious side effects that can include headaches, seizures, numbness or paralysis. Spice first appeared in Europe before being introduced in the United States and was temporarily banned by the Drug Enforcement Administration last year before being added to the federal government's list of banned substances in March.